Court: To say that we've loved Alessandra Torre for a long time feels like an understatement at this point...but here we are doing it anyway! This book was a breath of fresh air and if you're looking for something that has hilarious shenanigans and a little more under the surface than it seems then this is the book for you. Shel: Yes--so light-hearted and then packs an emotional punch when you least suspect it! Court: Autumn as a main character is absolutely hilarious. She is funny and legit has this idea that her sole mission in life is to save Declan Moss from mortal peril. Shel: When I figured out what was going on I cracked up! Being in her head is an interesting experience (understatement of the year), and as you read and get intel from her conversations with her sister (and brother in law Roger...he's hilarious, too!) and therapist you see that this is where things get a little twisted. Her perception is not reality...but goodness, between plane crashes and a trash switcheroo we wonder along with Declan...why him! Then...we get the added bonus of having Declan's point of view (swoon! ), and along with Nate and Nate's sister we get a delightful birds eye view to how this whole story is going to shake out. Nate and his sister was the perfect touch--I imagined them both with a devilish gleam in their eyes--they were so fun loving and hilarious. Court: As always, Alessandra's writing abilities are on point...she is like a fine wine that just keeps getting better and better. The dialogue is witty and funny, but also life affirming and deep at the same time. This isn't a suspense we're used to getting from her, but this was an escape that I will be coming back to again and again. Shel: I agree. Alessandra has written so much at this point that she's really written something for everyone, inside and outside of the romance community. And just when you think you've got her narrowed down to one genre or sub-genre, she does something new and different. It's one of the reasons I really enjoy her work--I know that I'll like her style and that she'll give me something I wasn't expecting. 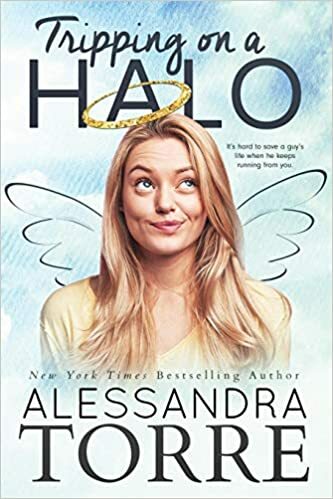 If you loved her novel, Hollywood Dirt, we think you'll really enjoy the humor, quirkiness, and sweet romance in Tripping on a Halo.